Authentic loin pork hailing from Tokachi, Hokkaido was used. Simply warm the bag itself and enjoy! Keep frozen until ready for consumption. Now you can enjoy this delicious meal at the comfort of your own home. Ingredients of butadon, including the pork meat, were not treated with antibiotics. Only the finest and most tender pork loins were used. 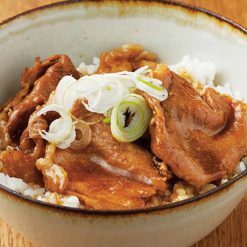 Butadon is a Japanese dish often translated literally into English as pork bowl, which is a bowl of rice topped with sweet simmered pork. The butadon pork bowls originally come from Obihiro, Hokkaido. According to history, by the time of the Hokkaido pioneering explorations from the Meiji era, people were already eating this dish. Sugar beets are used in a Hokkaido pig bowl for added flavor. These pork bowls are totally different from the pork bowls you see served at the common gyudon restaurants, because they use every meat on a pig. Tokachi is a subprefecture of Hokkaido prefecture in Japan. Obihiro is its capital. Take the frozen packaged bag and boil for about 4 minutes. Then serve over a single serving of warm rice. Warning: when the bag itself is touching the pot directly, it is possible for the heat to melt the bag and cause holes to rupture through. When opening the bag, please exercise caution because the bag will be hot. Cooking suggestion: in addition to the instructions, we also suggest topping the butadon with green peas. Simply sprinkle some green peas or green onions for some greens in your dish. A side of miso soup compliments this dish very well. 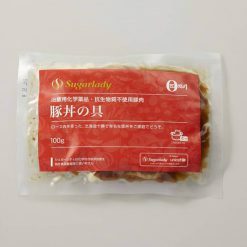 This product contains pork (domestic), soy sauce, sugar, syrup, apple, miso, fermented rice seasoning, sesame oil, garlic, ginger, potato starch, gelatin, glucose, sesame, onion extract, wine, wine vinegar, spices (red pepper), yeast extract (including some of the raw wheat). This product is not suitable for anyone with allergies to wheat, soy, pork, apple, gelatin or sesame. Origin of ingredients: pork (domestic). Prepared and packaged in Japan.